Internet of Things and IoT are synonymous and aside from talk of centralization, Coordinator and Coordicide, the IOTA Foundation has a penchant for advancing solutions for real world problems. This has been one of their many salient features and part of the reason why IOTA continues to attract talent. The native coin, IOT, may be down-trodden but as a coin that is specifically designed as a cryptocurrency facilitating machine to machine communication and value transfer, the coin is grossly undervalued at spot rates. Aside from its advisory board attracting visionaries and world-renowned experts, IOTA continues to improve the system. Like Cardano plans to completely decentralize via Shelly, IOTA will gradually phase out the protector, Coordinator, and allow for connected devices to secure the network via proof of work. That’s the way the network has been designed. Instead of clogging under transaction bombardment, it does the opposite. It becomes fast and more efficient even with proof of work as its consensus algorithm. Combined, their ambition to solve real world problems via MaaS for example, they have drawn the attention of Jason Hsu, a member of Taiwan Legislature. Jason is crypto friendly and it is his advocacy for friendly legislation that had him nicked named the “crypto congressman” by Vitalik. Thing is, IOTA may be down 6.3 percent in the last week but the coin is technically bullish. Additionally, with positive streams of supportive fundamentals, it is clear that there is an undervaluation at spot rates. Note that, and as highlighted in previous trade plans, IOTA is trading within a bull breakout pattern. Therefore, our confidence is based on that candlestick pattern and technically, every low should be another buying opportunity unless otherwise there are drops below 25 cents. As aforementioned, IOTA is trading within a bullish breakout pattern against the USD. And because the trend is positive sloping, we shall treat the current consolidation as another opportunity for traders to seek for buying opportunities in lower time frames. It’s easy to see why. 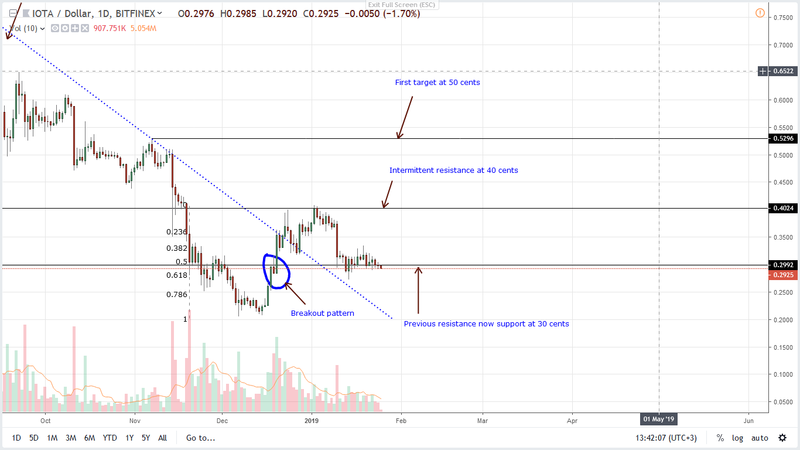 From the chart, IOTA is trading within the 50-61.8 percent Fibonacci retracement level drawn on Dec 2018 high low. Because it is a bullish pattern, aggressive traders can buy at spot prices. However, considering candlestick arrangements, a bull breakout above Jan 14 highs—the highs capping recent accumulation, should trigger a rally with first targets at 50—55 cents zone. Only then will risk-off traders initiate longs. Before then, risk-averse traders should be watching this from the sidelines. Our anchor bar is Jan 20. It is bullish with trade volumes of 28 million versus 12 million averages. Besides guiding and revealing bulls’ intent, it will also guide us in trend definition. Note that while Jan 20 did break above the 4-month resistance trend line, the bar is yet to be retested. Accompanying dropping prices consolidating at current support are dropping volumes with today’s averages at six million. It is low meaning demand has been low but supportive of bulls in an effort versus result point of view. We expect volumes to rise and as it builds up, the break above 33 cents should exceed current averages of six million. Only then will aggressive traders execute longs. Otherwise, odds are IOTA demand may fizzle out affecting price.